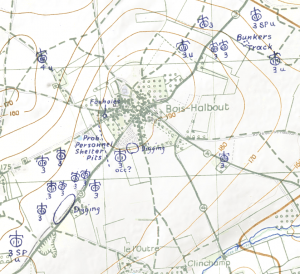 On June 6, 2018, to commemorate the 74th anniversary of D-Day, Scholars Portal and members of the OCUL Geo Community released a collection of Second World War military maps via Scholars GeoPortal. 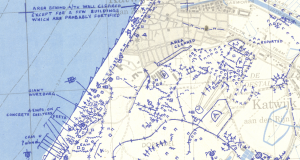 The maps were acquired by the Laurier Centre for Military, Strategic and Disarmament Studies (LCMSDS) in 1991 from the Department of Defence, Canada, and were recently digitized and georeferenced at the University of Waterloo Geospatial Centre. Sheet-level description was done with help from the University of Waterloo Geospatial Centre, McMaster University’s Lloyd Reeds Map Collection, as well as the expertise of many others in the OCUL Geo Community. 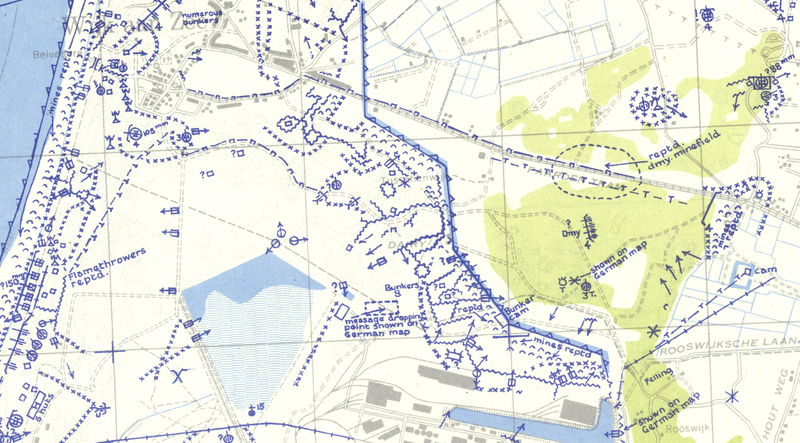 Defence Overprints: Maps that have been overprinted to show information related to defence and gathered through air photos and reconnaissance. 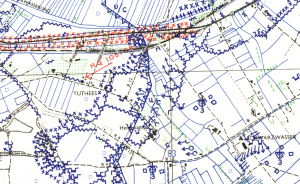 This can include any information relevant to the movement of troops in the area and any battles that might take place (for example, bridges, gun emplacements, and more). 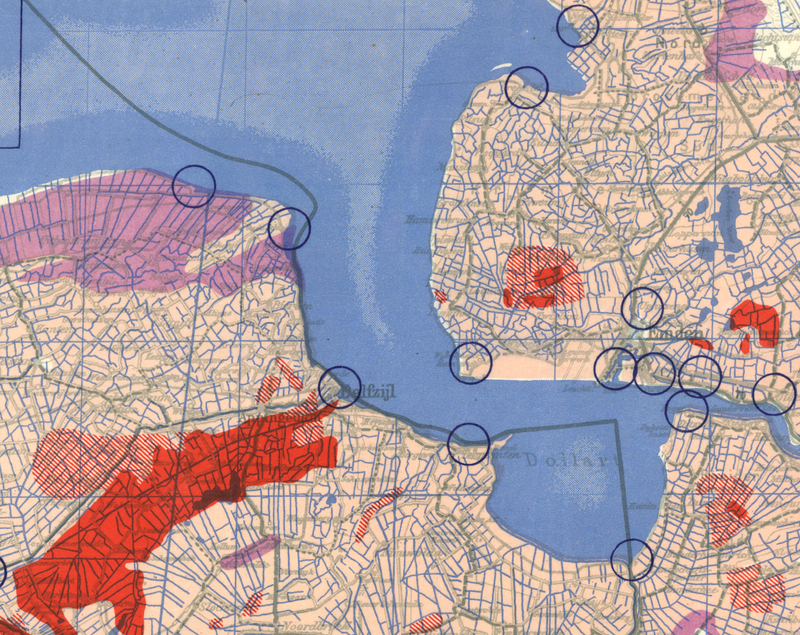 Flooding overprints: Maps that have been overprinted to show areas prone to flooding and/or easily to flood, for strategic planning purposes. 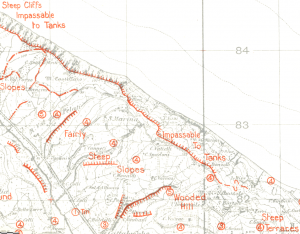 Tank “going” maps: “Going” maps are overprint maps produced for tanks. The information overprinted usually shows which areas the tanks should navigate in order not to get bogged down in soft earth (areas they could get “going” in). Digital scans of these maps, along with other historical military maps, are available from the McMaster University Library. Issum Going Map: This is a 1:25,000 scale ‘going map’ of the region of Issum, Germany. It was published on October 12, 1944 by the Geographical Section, General Staff (GSGS) of the War Office of Great Britain. 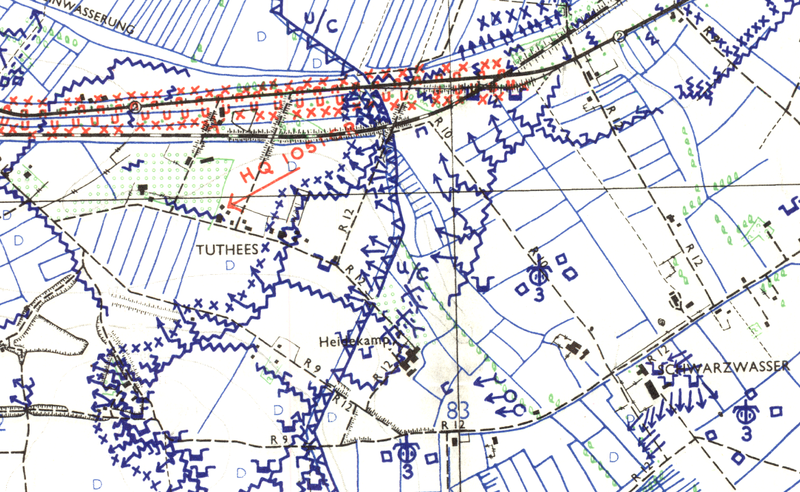 Going maps show the surface conditions of the area, and any possible obstructions to troops and tanks. By fall 1944 the Allied forces dominated the airspace over northwestern Germany, allowing them to create detailed maps based on air photos. 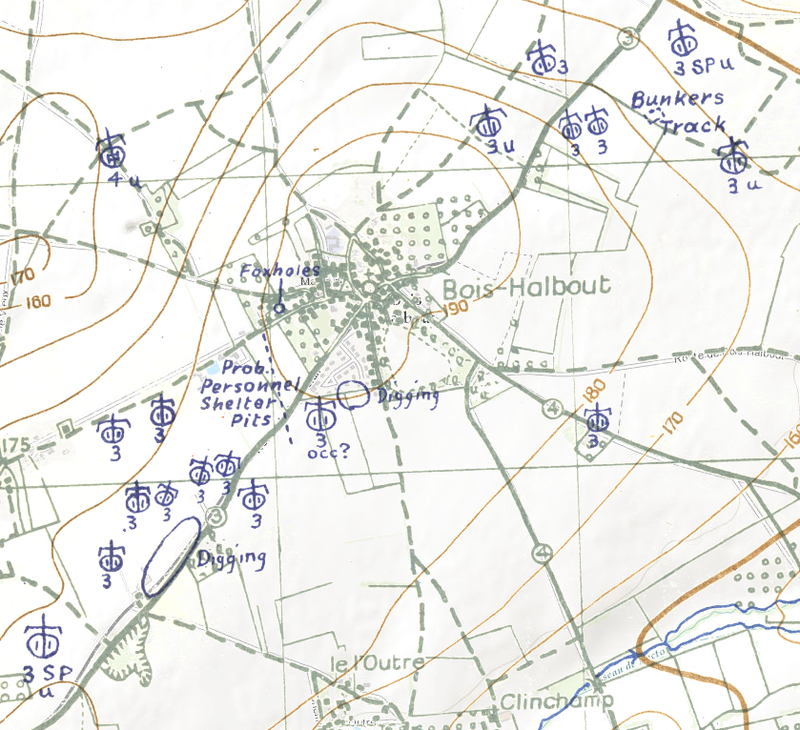 Potigny Defence Overprint: This is a 1:25,000 scale map of Potigny, France, prepared for the purpose of Operation Totalize. It is a defence overprint published by the Geographical Section, General Staff (GSGS) of the War Office of Great Britain on August 6, 1944. Operation Totalize was an offensive by the Allied troops of the First Canadian Army on August 8-9, 1944, and was part of the latter stages of Operation Overlord (now known as the Battle of Normandy). 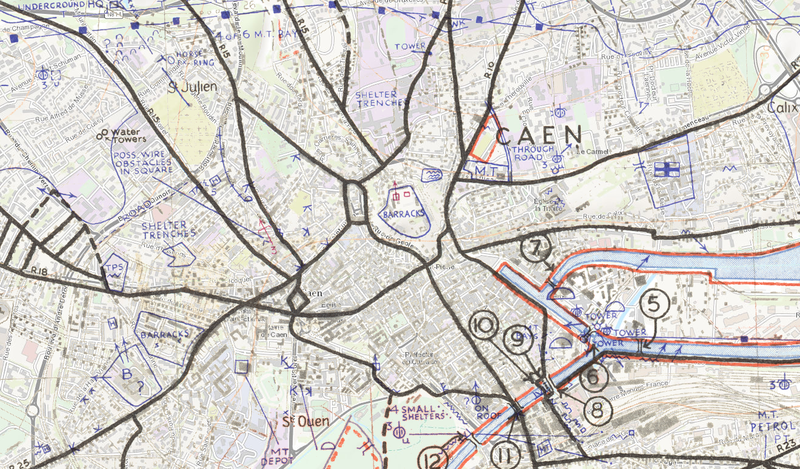 This map highlights the positions of bunkers, shelters, and bomb sites. Porto di Pesaro Going Map: This is a 1:25,000 scale ‘going map’ of the region of Porto Di Pesaro, Italy. It was published in August 1944 by the Geographical Section, General Staff (GSGS) of the War Office of Great Britain, likely in preparation for Operation Olive, an Allied offensive in the Italian Theatre near the end of that month. 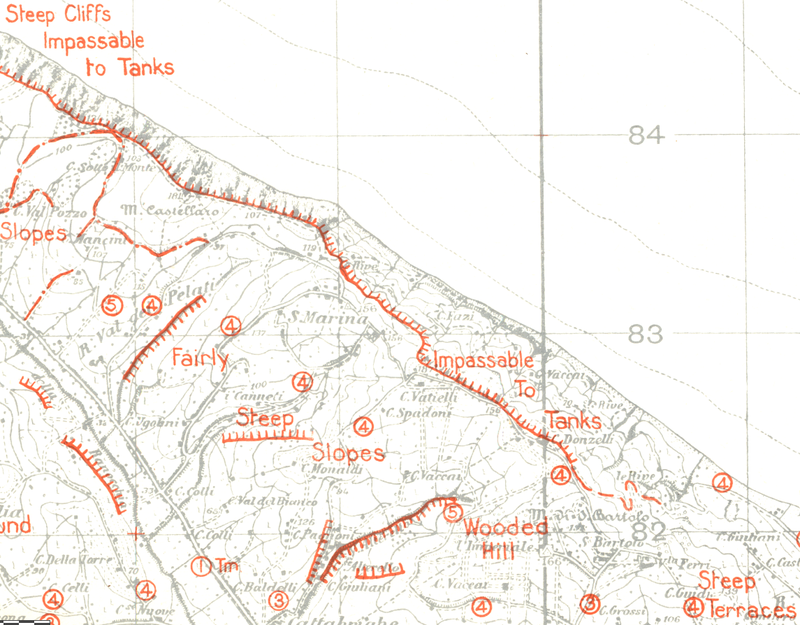 Going maps show the surface conditions of the area, and any possible obstructions to troops and tanks. This going map was created for the purpose of assessing obstacles and terrain for armored fighting vehicles (AFV). Dunkerque Defence Overprint: This is a 1:25,000 scale composite map (defence overprint) of Dunkerque, France, published on September 11, 1944 by the Geographical Section, General Staff (GSGS) of the War Office of Great Britain. 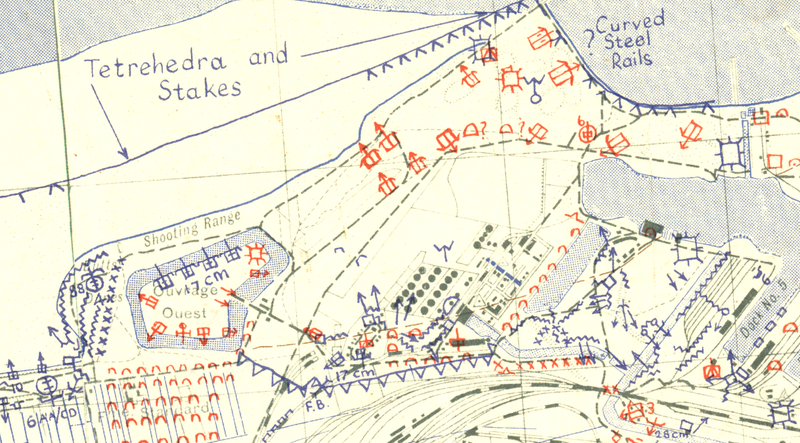 This map features defenses, obstructions, and bunkers. 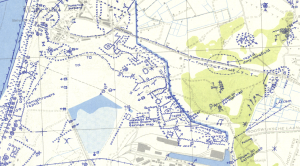 The Siege of Dunkirk began just days after the publication of this map, when Canadian forces surrounded the city on September 15, 1944, and lasted until the end of the war. Deventer Geological Overprint: This is a 1:25,000 scale map (geological overprint) of the region of Deventer, Eastern Holland. It was published in 1944 by the Army Map Service of the United States Armed Forces. 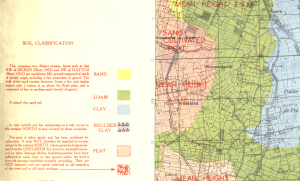 This map features the types and states of soil in this area. Deventer was one of the towns liberated by Canadian forces in April 1945. Leiden West Defence Overprint: This is a 1:25,000 scale map (defence overprint) of the region of Leiden West, Holland. It was published on April 12, 1945 by the Army Map Service of the United States Armed Forces. 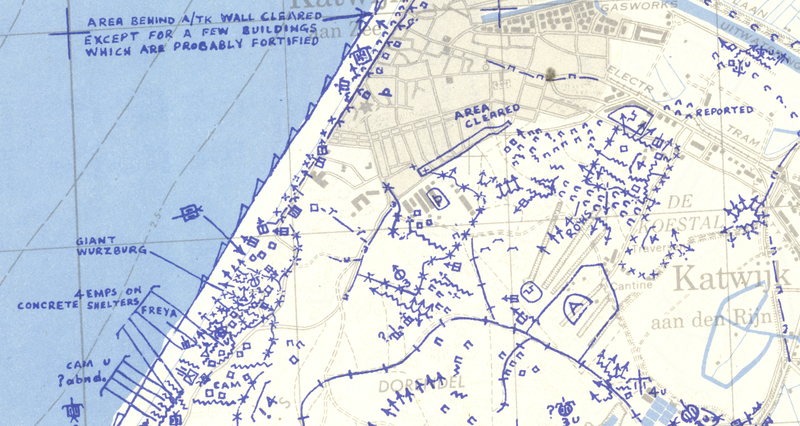 This map is heavily marked, and features: trenches, tunnels, defenses, shelters, mines, and reclaimed areas. 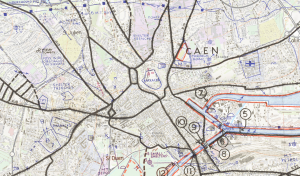 Caen Defence Overprint: This is a 1:25,000 scale map (defence overprint) of the region of Caen, France. It was published in May 1944 by the Geographical Section, General Staff (GSGS) of the War Office of Great Britain. 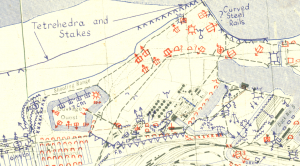 This map features: barracks, shelter trenches, and obstacles. Capturing Caen was originally a goal of D-Day on June 6th, but this was not achieved and fighting in the area continued until August. Kranenburg Defence Overprint: This is a 1:12,500 scale map (defence overprint) of the region of Kranenburg, Germany. It was published on February 2, 1945 by the Royal Canadian Engineers. This map features many markings compiled from both air and on-ground observations. Ijmuiden Defence Overprint: This is a 1:25,000 scale map (defence overprint) of the region of Ijmuiden, Holland. It was published on April 12, 1945 by the Army Map Service of the United States Armed Forces. During their occupation of the Netherlands, Nazi forces used the ports of Ijmuiden to house submarines and torpedo boats.